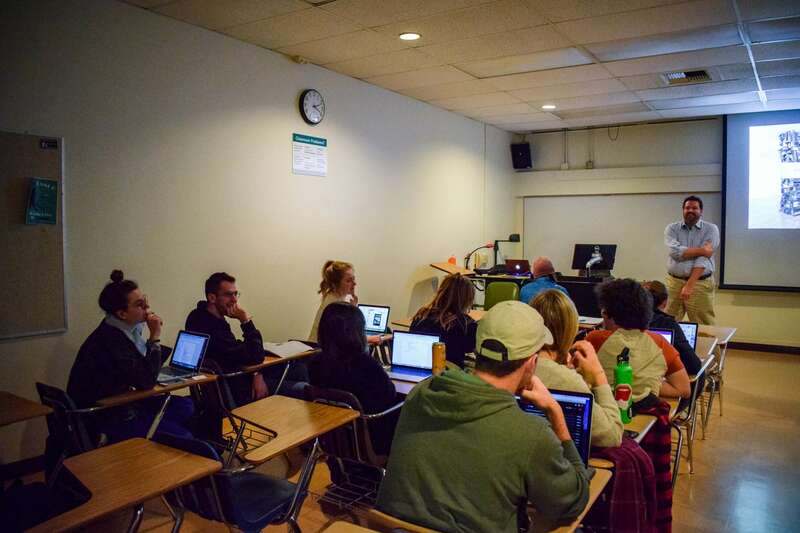 Students in Art History – Art Since 1945 (ART 315) participate in a virtual art market through a game created by Cal Poly lecturer Matthew Fisk. The game gives students a chance to participate in a virtual world of buying and selling art as well as building an art collection for clients. In the game, students randomly draw from a hat to be assigned a location, varying from Topeka, Kansas to Cork, Ireland. From there, students randomly draw a “site,” ranging from nonprofit organizations to venture capital firms. After they are assigned a site, the students build an art collection for their given space. “They are essentially building virtual art collections with a number of different limitations, parameters, and obstacles in their way as it develops throughout the term,” Fisk said. Every week, students pick from a variety of real, online art auctions and send pictures of their choice pieces to Fisk. He approves or denies the selection into the student’s gallery, based on relevance to the class. The game allows students to have a unique role in the process of curating art. Ratuznik was assigned to create an art collection in a performing arts center in Cleveland, Ohio. She created a vision of the architecture of the building as well as the works of art inside, incorporating her love of photography in the process. “I personally get very inspired by creating a vision of what the place looks like,” Ratuznik said. Students in the game have the creative freedom to design their space within the parameters of the clients’ desires. “What they’re doing is creative work, even though it is practical, too,” Fisk said. Fisk received his Ph.D. in History of Art from UC Santa Barbara in 2013. After years as a student learning from a traditional model, Fisk said he wanted to teach art history in a way that was less passive and more interactive. Students in the class not only learn about the history of art, but they learn how the value of art changes and how it is affected by collectors in the market. According to Fisk, this game-based learning technique is widely used in a range of schooling, from public health to management. However, he has never seen the model used in the field of art history. This is Fisk’s first quarter teaching at Cal Poly. He has successfully used this game as a teaching model in his career in the past, including his time as a professor at Boston Architectural College. He said the game works well for Cal Poly’s hands-on learning approach. “It just happens to be perfect for the Cal Poly Learn by Doing philosophy,” Fisk said. Art and design junior Victoria Berceau said the class has opened her eyes to the monetary value of art, teaching her about the art market in a way she had never experienced before. She is considering a career in visual displays in the future, and the game has given her a way to design a space of that nature.